Key Difference: Call by value and call by reference are both methods of passing arguments. 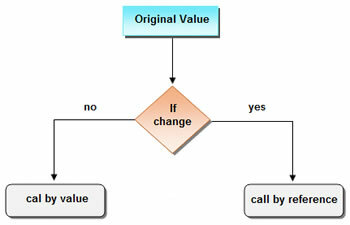 In call by value, a copy of actual arguments is passed to respective formal arguments; whereas in call by reference the location or address of the actual arguments is passed to the formal arguments. Call by value and call by reference are both methods of passing arguments. They can be used to pass value or data to another function. However, the manner in which they pass the arguments differ. The primary difference between the two is that in call by value, a copy of actual arguments is passed to respective formal arguments; whereas in call by reference the location or address of the actual arguments is passed to the formal arguments. Due to this, any changes made in the formal arguments will also reflect in the actual arguments. Hence, care should be taken when using call by reference as it is very easy to accidently make changes in the formal arguments. Call by Value is generally used as the default function in most C programming languages, especially such as C++, PHP, Visual Basic .NET, C# and REALbasic. However, most of them support Call by Reference by offering special syntax for call-by-reference parameters. Still, in C all the function arguments are passed by value, as C does not support references as the other languages do. The reason for this is the fact that in C the calling and the called functions do not share any memory. As they each have their own copy, the called function cannot directly alter a variable in the calling function. It can only alter its own personal copy. So, the call by reference would be pointless here. Any changes made in the formal arguments will also reflect in the actual arguments. Changes made inside the function are reflected outside the function as well. Original value is not modified. Actual arguments remain safe, they cannot be modified accidentally. Actual arguments are not safe. They can be accidentally modified. Hence care is required when handling arguments. Supported by most programming languages, but not as default.